The Fellowship was fortunate enough to obtain a copy of GHOSTBUSTERS DEVIATIONS from IDW Publishing. The story is by Kelly Thompson, with art by Nelson Daniel, and lettering by Neil Uyetake. It’s been thirty days since the battle of New York, and the Ghostbusters are still trying to figure out how to eliminate Gozer the Destructor. Instead of being the toast of the town, they are public enemy #1 (other than the giant marshmallow man). Our heroes come up with a desperate plan to rid themselves of the otherworldly threat and rescue Dana and Tully. But have they exchange one problem for another? DEVIATIONS is IDW line of one shot comics where the story goes a different direction from the path we know. If you are familiar with Marvel’s WHAT IF? or DC Comics’ Elsewhere line, it is a similar concept. With GHOSTBUSTERS, the guys didn’t cross the streams from their proton packs to take out Gozer. I’ve always liked the story concept and glad that IDW has taken up the mantle. Thompson definitely captured not only the voices of the characters, but the spirit of the original film and delivers a knockout tale. If you’re a fan of the film, it’s worth picking up. 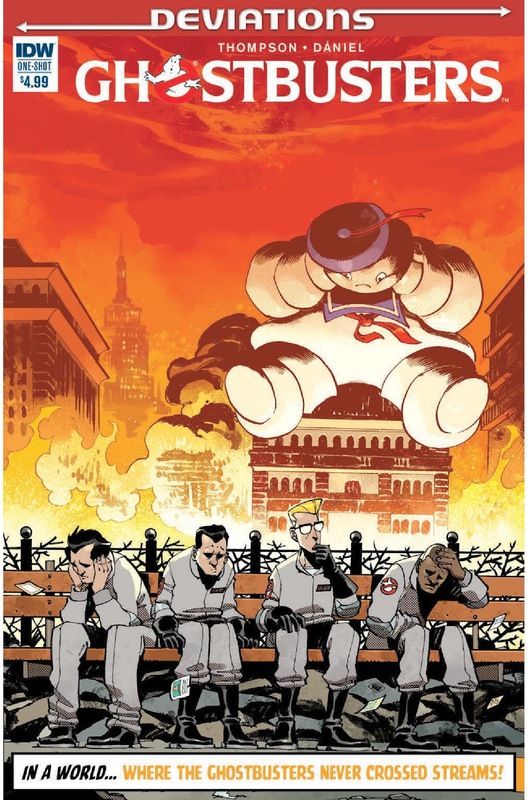 GHOSTBUSTERS DEVIATIONS is in stores now, or available for ordering at www.idwpublishing.com.